While thai food can be an excellent option for eating gluten free, most thai restaurants use soy sauce (which contains wheat). However, you can easily make some delicious thai dishes at home that are healthier and gluten free. Most love a good curry which is why I wanted to share with you this amazing Thai Coconut Curry Shrimp dish! The beauty of this recipe is that if you don’t like shrimp (as I don’t), you can easily substitute it with any type of protein you love! Want to make it vegan? No problem. Just add some beans and grains. Paleo? Again, that’s super easy and you’ll see how you can modify this recipe in the notes below so that it makes a perfect meal. As I mentioned above, when dining out at a thai restaurant, most dishes won’t be gluten free due to the use of soy sauce. However, curries are your safest bet (there are typically a nice assortment on a menu). Always make sure to ask the waitstaff to double check what dishes are gluten free and that no soy sauce is added. Some restaurants will allow you to bring your own GF tamari in the event that your favorite dish requires soy sauce. While dining out does involve some risk of gluten contamination (unless a restaurant is 100% GF or they know how to serve proper gluten free food), it doesn’t have to be stressful. You just have to ask questions up front, be clear about your needs, sensitivities and allergies, and triple-check your food. Cooking outside of your dinner routine can be really daunting, especially when it comes to trying out unfamiliar ethnic foods in your own kitchen. Fortunately, this delicious Thai meal can become one of the easiest go-to dishes in your bag of culinary crowd-pleasing (or family-pleasing) tricks. By using basic ingredients with a few specific items easily found at most chain grocery stores or on Amazon, you can whip up a hearty, satisfying meal in no time at all, often without much (or any) planning. Not only is this dish delicious, it is full of anti-inflammatory ingredients that support overall health. The delightfully distinct flavor profile comes from the curry paste contains fragrant herbs and spices such as lemongrass, galangal/Thai ginger, fresh green chilies. Full of antioxidant-rich vitamin-packed veggies, this dish also offers clean protein source option as well (which is great if you’re not a big shrimp fan). The healthy fats found in coconut milk and coconut oil can support healthy brain function as well as help to balance blood sugar while making sure you feel full. Garlic and ginger are natural antibacterials that support gut health, and can aid in digestion. This dish is free of allergenic foods such as gluten, corn, dairy, eggs, and soy (if you opt to use coconut aminos), and can also be made vegan (try substituting chick peas) and prepared paleo (by omitting grains). Even better, curry is perfect for any time of year. The bright, tangy citrus and cilantro flavors, warm earthy curry spices, and hearty sweet vegetables-a-plenty make it the perfect summery dish, yet the rich, deep flavors are a satisfying cold-weather dinner option you will love. One of the best things about this dish is its versatility. You can easily mix and match ingredients based on what you have readily available or what is in season. Once you have the basic sauce components on hand (which I try to stock in my pantry at all times), swapping out the protein and veggie selections provides endless combinations and entirely new meals each time you make it, allowing you to be creative and experiment in the kitchen – with confidence! Carly Sage a certified health coach and the creative force behind SageGlow, as well as her other important roles as a mom and fuss-free foodie. She’s delighted to prepare simple home-cooked meals daily that support her health. After struggling for many years with health issues that no doctor could explain, Carly began her quest to figure out what was going wrong. In the process, she discovered that she has celiac disease. Since then, she’s used food and lifestyle modifications to heal her body, get her life back, and advocate for “food first.” Carly’s inspirational health journey is a catalyst for others to take small, mindful steps to embody the art of living well, naturally. Visit Carly at SageGlow! Why try Thai? Because it’s the perfect excuse to get out of your dinner rut and support your healthy lifestyle with minimal time, effort, and cost. Even better, the ingredients are easily accessible, nourishing, totally satisfying...and definitely not boring! This dish has an exotic flavor profile but is actually quite simple to create in your own kitchen using an abundance of vegetables and protein of your choice, giving you the freedom to mix and match flavors on a whim. Defrost frozen shrimp: place in bowl with cool water running slowly over it in the sink, so water can drain off consistently (approximately 15 minutes). To prep shrimp (that is not already pre-peeled and deveined), drain water completely out and peel shrimp individually. When peeled, take a paring knife and run a slight cut down back of shrimp to expose the large black vein. Remove and discard in separate bowl. Roll lime on hard surface until it softens and then cut it in half. Juice one half and cut the other half into slices for garnish. Wash and cut all vegetables of choice into bite size pieces. Cook quinoa, rice, or noodles according to package and set aside. Turn a large nonstick pan to medium/medium-low heat and add 1 heaping tbsp coconut oil. Add chopped onion to pan when oil is melted, coating thoroughly. When onion is soft and glistens, add ½ the amount each of the ginger and garlic. Stir often to allow for even caramelization. Add another tbsp coconut oil to pan, add cut veggies to toss thoroughly, coating evenly. Cook for 5-7 minutes until veggies are softened and have browned slightly. Add can of coconut milk and stir well. Add curry paste and stir into sauce, making sure to eliminate any clumps. Add ½ t chili sauce, 1 tsp wheat-free soy sauce (coconut aminos or GF tamari), juice from ½ lime (1 tbsp), stir, and turn down heat to low and simmer about 8 minutes. Add ¼ cup chopped cilantro near end of simmering. While sauce is simmering, heat 1 tbsp coconut oil in a large non-stick pan on medium high heat, add shrimp when oil is hot. Add ¼ tsp each salt & pepper, 2 cloves garlic and ½ amount of chopped ginger (1 tbsp) and sauté for 5-8 minutes, or until shrimp turn pink and develop a faint brown sear. Add ½-1 tsp sriracha and 1 tsp wheat-free soy sauce (coconut aminos (or tamari), juice from ½ lime (1 tbsp), stir well and sauté for another few minutes until you develop a nice brown sear on the shrimp, being careful not to burn them. Turn off heat. Transfer quinoa, rice (such as short brown or jasmine), or noodles to plate, spoon vegetable mixture and sauce over, and place shrimp on top. Garnish with remaining chopped cilantro and lime wedge. Add more or less ginger, garlic, and seasonings depending on taste. 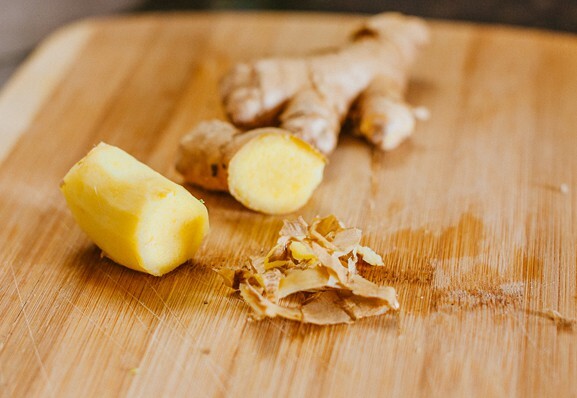 Peeling and dicing ginger root: remove thin skin with a vegetable peeler, sharp paring knife, or the edge of a spoon. Cut into disks, lay flat and cut into thin strips, then cut the bunch into tiny diced pieces. Peeling and dicing fresh garlic: I like to use a garlic press, which eliminates the need to peel or chop garlic. If you do not have one, peel garlic by smashing gently to release peel, and slice into disks, lay flat, and cut into tiny strips, then cross section and cut into tiny diced pieces. Use an assortment of vegetables and do not overcook. Desired consistency should be crisp tender and bright in color to preserve nutrients. For a paleo option, skip the grains and spoon sauce and veggies over cooked spaghetti squash, zoodles (HERE's how to make them), grain-free fettuccine from Capello's Pasta, or pan-seared greens such as kale.